Gorgeous day for hiking. The sun shone, the views were spectacular, what more could you ask for? We met at Warkworth and car shared up to Craster, where we joined the Northumberland Coastal path and headed south to Howick, then Boulmer, then Alnmouth (where we paused for lunch and an ice-cream) then onwards for the final 4 miles down the fantastic sandy beach to Warkworth. Today it felt like summer might finally be here. So, on Friday Sean and I headed off for the Langdale Valley. 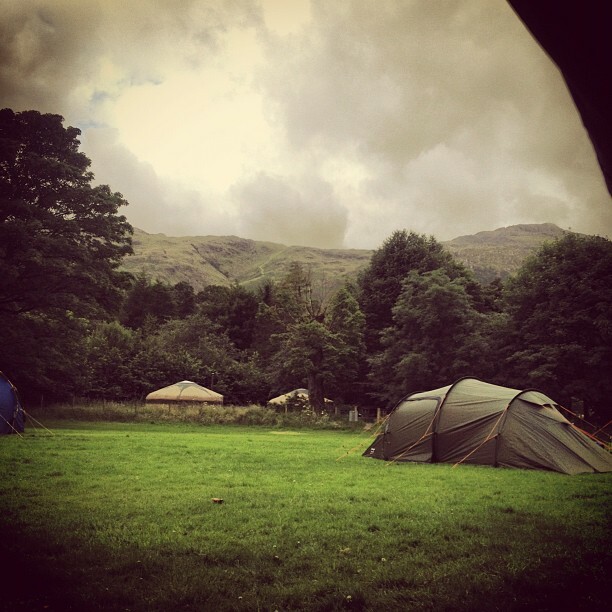 We were booked to be staying on the National Trust campsite at the bottom of the Langdale Valley. Daniel and Nicola, also from Darlington Dales and Hills, were joining us and the plan was for a long weekend of big walks. Sean and I arrived at lunch time, got the tents up in glorious sunshine, and decided to have an afternoon ramble up Lingmoor Fell and down to Chapel Stile before heading back along the valley to the campsite. 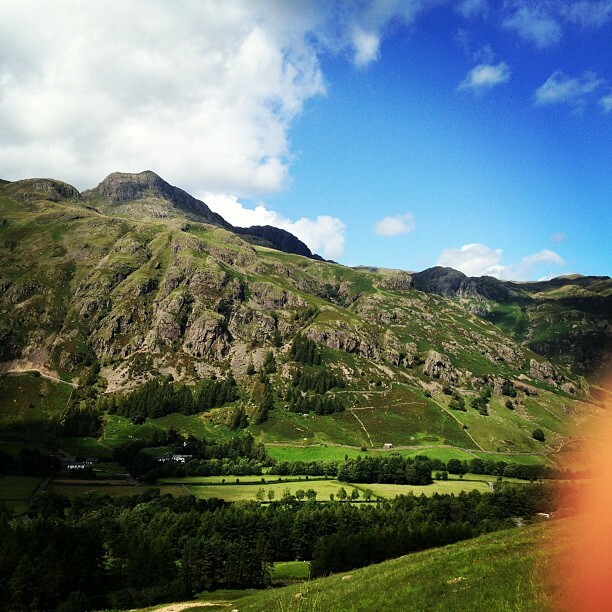 It was hot going in the sunshine, but the views of Crinkle Crags and the Langdale Pikes was absolutely stunning. We really enjoyed the walk, how could you not wish such fabulous weather and scenery. When we got back we sat in the sun for a while before getting a shower and changed and walking down the road to the Sticklebarn pub. Last year I was really pleased with the Sticklebarn because it did an amazing vegan curry. Unfortunately, it looks like the place has been bought by the National Trust who have completely changed the menu, and now there is nothing vegan on it. 😦 I ended up with a salad, some peanuts and some chips for tea, which was disappointing. However, despite the food disaster we had a nice evening there people watching. We got back to the campsite at 11, just as Nicola was finishing putting up her tent. Unfortunately Daniel decided not to come because he was suffering from both a bad back and a cold. It was late and had started to drizzle, so there was just enough time to wish Nicola goodnight and head off to bed. I had breakfast, got myself together, and the three of us set off for St Bees to visit Andy and Amy, former members of Darlington Dales and Hills who moved to Cumbria a few months ago. 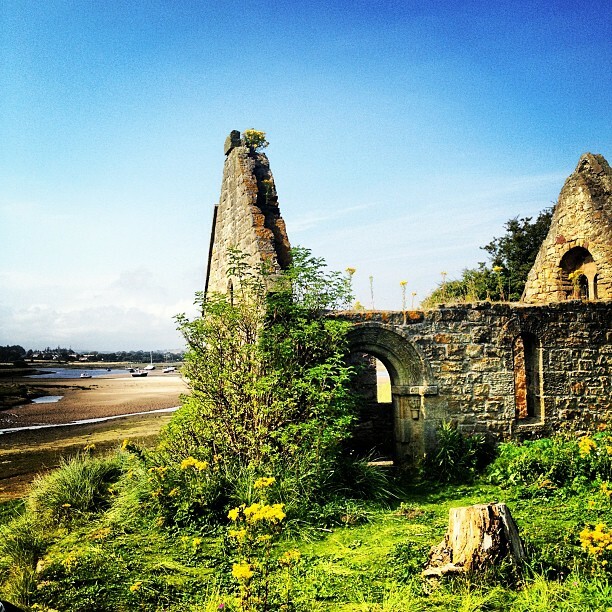 The plan was to see their fabulous new cottage and have a walk along the coast with them. Sean decided to drive to St Bees over the most terrifying mountain passes, with steep gradients and tight hairpin bends. It was fabulous scenery but a bit scary in such wet and grey weather. It was still raining when we arrived at St Bees, and was blowing a gale on the coast. However, undeterred we set off with Andy and Amy on our walk. The walk was really nice, and followed the first section of the Coast to Coast path for several miles. 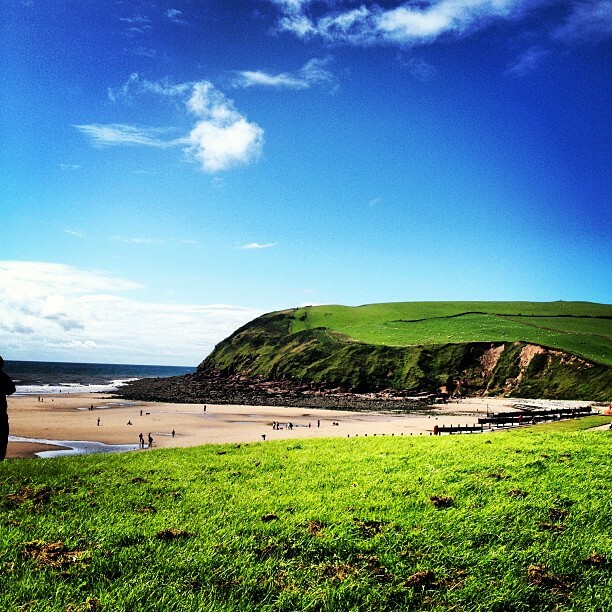 As we walked the weather got better and better, and by the time we arrived back in St Bees the weather was glorious! After having a reviving cuppa at Andy and Amy’s house we left them in peace and headed back to Great Langdale for a shower and then into Ambleside for dinner. We went to Zeferellis for dinner. Zeferellis is a vegetarian restaurant with lots of vegan options. The restaurant was busy when we arrived, but they suggested we went upstairs to eat in the Jazz Cafe. The menu was just about the same, but it was more informal and there was a great jazz band to enjoy whilst we ate. It ended up being a fantastic evening, with excellent food, and great music. We stayed all evening, long after we finished eating. I really enjoyed Zeferellis and plan to eat there again when I go back to the Lakes in August. After a night of extensive rain Sunday was big walk day, and I took the three of us up to Stickle Tarn and then up Pavey Arc, Harrison Stickle and Pike of Stickle before looping around and coming back down the Cumbria Way. The weather when we set off was wet, but just like the day before, improved as the walk continued. By the time we were heading down at the end of the day the weather was pretty nice. We got back to the campsite and had a quick shower before heading to Chesters on the River and Skelworth Bridge for coffee and in Nicola and Sean’s case huge slabs of cake! Sadly Nicola had to go home then, but Sean and I continued into Ambleside, dodged the rain showers for a bit, and then had dinner at a Thai restaurant in town who had an early evening meal deal on. After dinner we had a coffee in Esquires before driving back to the campsite. It was still fairly early so we walked to the Old Dungeon Gyll Hotel for a few drinks before bed. We sat outside under a canopy and watched the rain absolutely hammer down. It rained heavily all night, and was still raining as we packed down the tents. After several days of big walks we decided to have a slightly more gentle day today, and with improving weather I took Sean on one of my favourite walks around Loughrigg from Elterwater. We dodged the showers all day, but managed to stay mostly dry. The walk took us right past Chesters so we stopped there for lunch and a coffee, sitting in the warm sunshine, before finishing he walk about 2.30pm. It was an absolutely fantastic weekend. I had a fabulous time and despite the weather being really mixed, with rather too much rain, I think it would have been difficult to have have a better time. 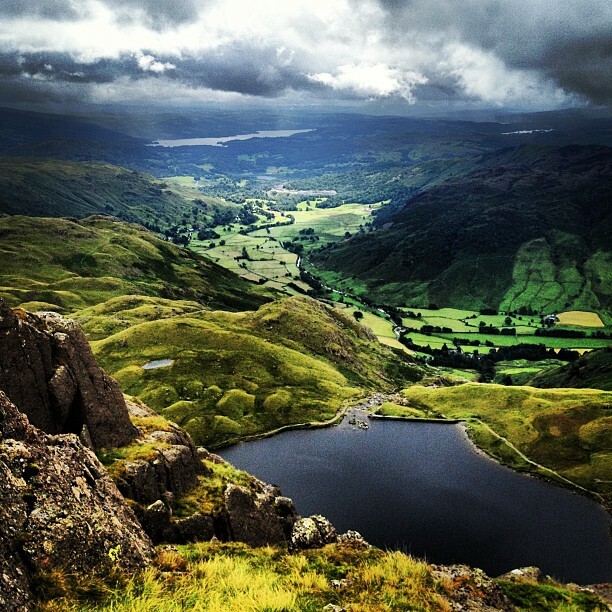 I’m back in the Lakes for the August Bank Holiday weekend and really cannot wait to get up in the hills there again. This weekend we had 20 members of the Darlington Dales and Hills in North Yorkshire for wet weekend! We headed down on Friday night through awful storms and roads that were flooding all around us. What is it with the weather this summer? We were staying in Clapham near Ingleton in North Yorkshire, and when we arrived it was absolutely pouring down and the river running through the village was threatening to burst it’s banks. We unpacked and after a quick one in the local pub, headed back to The Old Manor House to unpack and have a few drinks in the bar there. 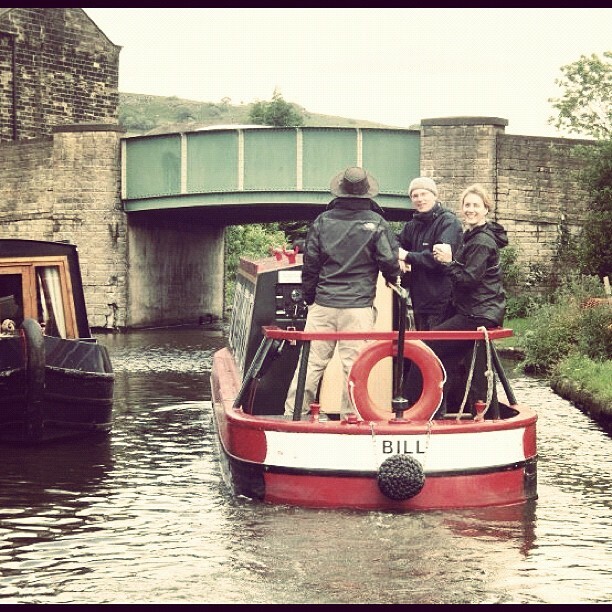 The next morning we got up fairly early and headed to Skipton where we had hired two canal boats; ‘Bill’ & ‘Ben’, for the day and evening, on the Leeds to Liverpool canal. We had a fantastic time on the canals all day, chugging along enjoying the view and drinking lots of cups of coffee. The next day we went out for a hike in Crummackdale. Enclosed on three sides by pale-grey escarpments, the walled fields and green lanes of Crummackdale are ringed by an almost lunar landscape, scoured by a glacier 15,000 years ago. 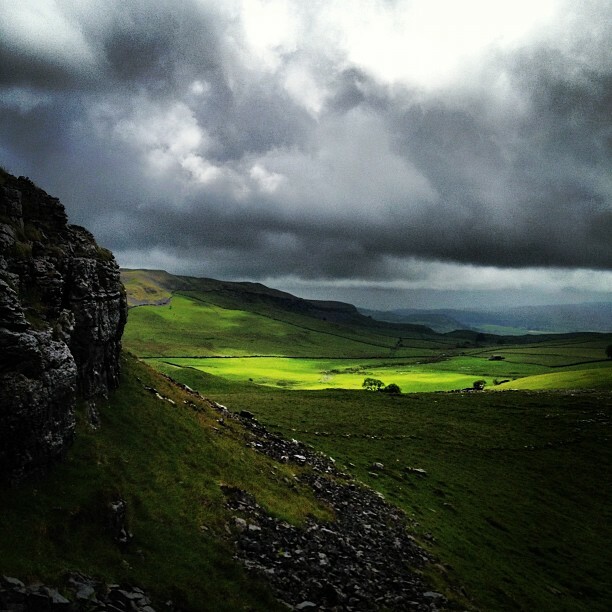 The weather was really mixed: plenty of rain, plenty of sun, and moody skies all day, but the walking was fantastic. Sorry about the lack of posts for the past fortnight. I’ve been having a little early summer holiday in Wales and actually had no internet access whilst I was away. This was actually a pretty good thing for me, it meant that I just chilled and relaxed rather than sneaking a look at my work emails every half hour! 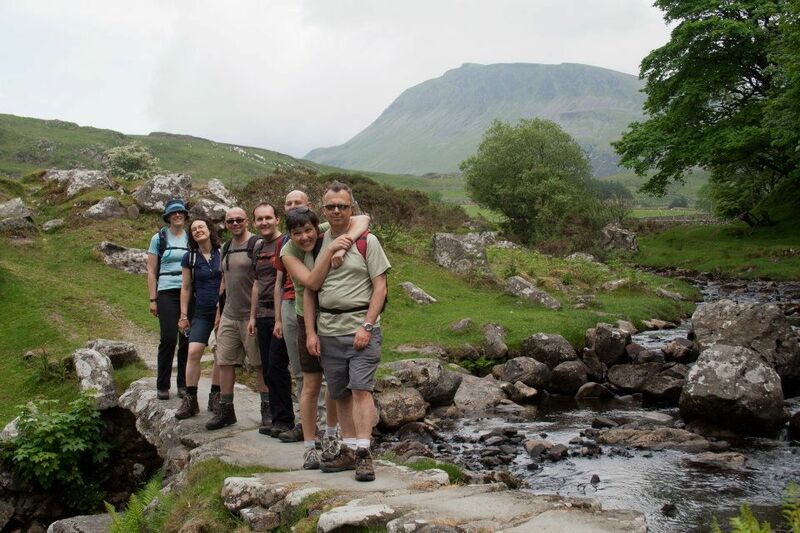 On Saturday 2nd June I drove down to Snowdonia to meet up with several other members of Darlington Dales and Hills for 4 days of exploring southern Snowdonia. We met at Cregennen Lakes at lunchtime and had a wonderful walk down to Barmouth on the coast to cross the toll bridge and then back again. It was pretty hot and humid, but nice for walking. After getting back from our walk we drove through to Machynlleth where we had rented a cottage for the weekend. The rest of the group went out to a local pizzeria for tea, but me and Joy chilled out at the cottage and made our own meal. On Sunday the weather was absolutely horrible. The clouds were right down and it was raining. 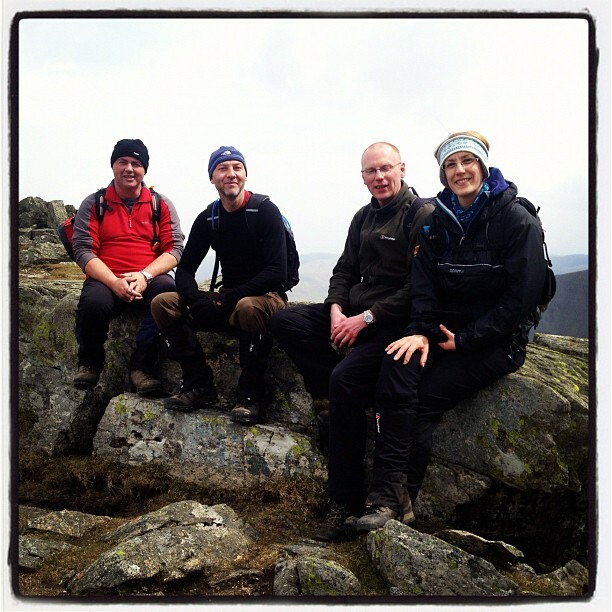 This was a huge shame because we had planned to climb Cader ldris that day and were looking forward to the views from the top – fat chance of that! However, we still planned to climb it so we drove the short distance to the start of the walk and set off, bundled up in our waterproofs. The walk is pretty steep right from the offset and even though it was raining it was pretty humid, so it was hot going! 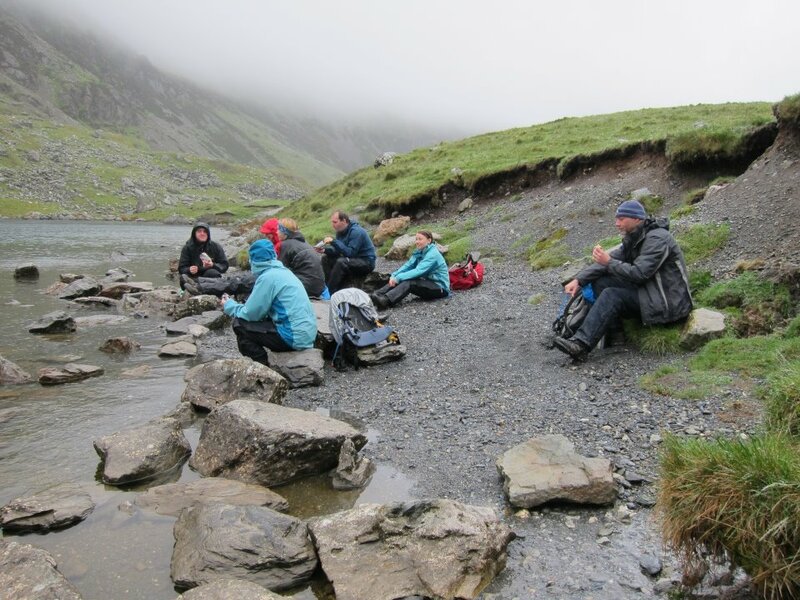 We got up to the lake in the bowl of Cader Idris and had some lunch. You couldn’t see the top of the mountain at all because the cloud was right down, and it was pretty windy too. Liz, Michael and I decided that we weren’t going to go up to the top. It seemed a bit of a thankless task given that there would be no views and it was so windy. Instead we walked around the lake and then headed back down. The rest of the group went up, but they said it was pretty grim up there. Such a shame that it was so horrid. I’d like to go back and do it when the weather was a bit better because it was a pretty good walk. Luckily the weather picked up the next day, and Monday turned out to be the best day of our trip. Again, the group split up. Some of the group went mountain biking, whilst the rest of us went off to walk up Tarrenhendre. Tarrenhendre is close to Cader Idris and promised great views of the Snowdonia range as well as up and down the Welsh coast, so I was looking forward to it. The walk started off in Abergynolwyn where there was a steam railway. We parked up at the station and headed up into the forestry above the village to begin our climb. The sun was out and it was lovely weather for walking, but the midges were an absolutely nightmare, and whenever we stopped on the climb up the midge clouds gathered and we got bitten to death! It was really frustrating! The climb up to the top of Tarrenhendre was steep and really hard going but the views that we were rewarded with at the top were absolutely fantastic. We could see the Snowdonia range, the Llyn Peninsula to the north, and Cardigan bay to the south: it really was stunning. 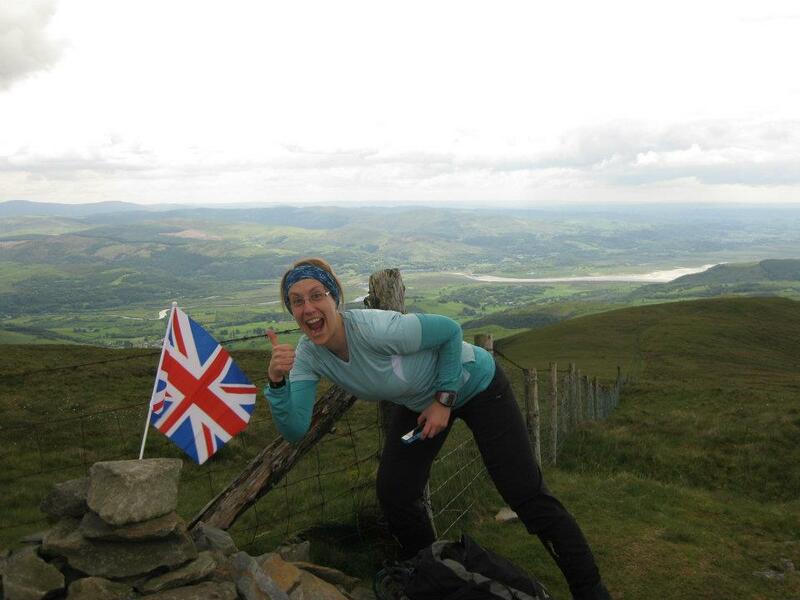 Also, as it was the Jubilee we topped the cairn with a Union Flag! On Tuesday it was time to leave, but not before we squeezed in one more walk on the way back North. Unfortunately the weather was dreadful (heavy rain and thick cloud again), but we didn’t let that put us off and we headed north to climb Cnicht: the Welsh Matterhorn! Unfortunately we got started on the walk a little later than planned, but this actually worked in our favour as, shortly after starting the walk, the clouds lifted and the rain stopped, which meant that when we reached the top we actually had really great views down to the coast and the Llyn Peninsula. However, this didn’t last and the last couple of hours of our walk were very wet indeed, and we were pretty drenched by the time we got back to the cars. However, we had enjoyed a good few days walking, despite the weather! I headed up to Liverpool from there to spend a few days with my Nan and Uncle Eric, whilst the rest of the group headed back to the North East. 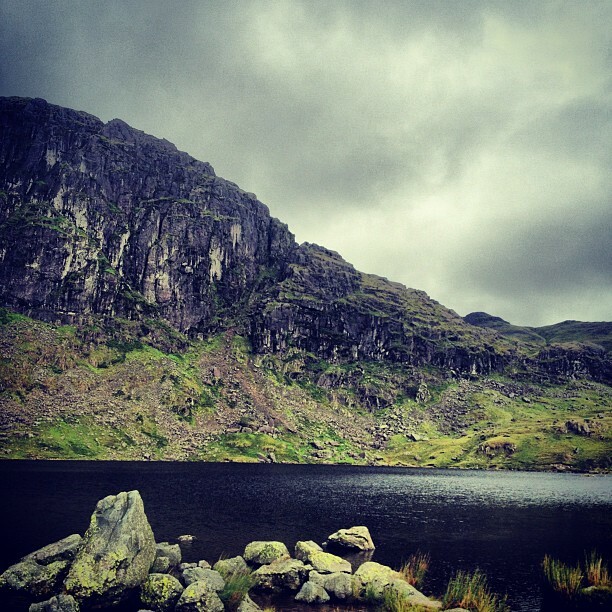 I really enjoyed my walking in Snowdonia, and would definitely like to return to do some more hills (and to tackle Cader Idris when the views can be enjoyed). The only down side was that for the first time in my life I got bitten by a tick, nasty little thing! I got the bugger out, but I’m keeping an eye on the bite site for rashes and any symptoms of infection (and Lyme Disease) although I believe Snowdonia is fairly low risk for this. So after spending a couple of days in Liverpool it was off to South Wales for a week of Pembrokeshire adventures….! Very, very hot but fun walk this Sunday from Gainford to Barnard Castle. The route followed the river, for the whole route and it was delightful to ramble along next to it in the gorgeous sunshine. We picnicked at Whorlton Lido, and were gutted to discover that The Bridge Inn in Whorlton, where we had gone for a post-lunch drink, had closed! We also met a herd of alpaca in the fields by Rokeby Park, who seemed quite interested in us! The DD&H had a lovely ramble in Wensleydale on Sunday 20th May. 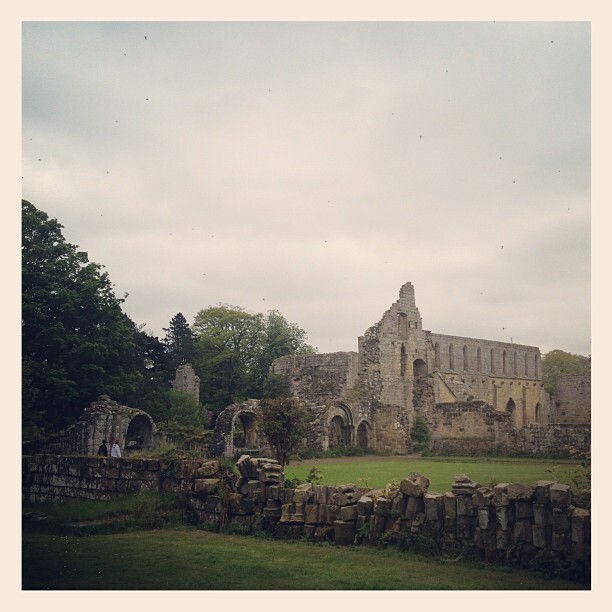 A fairly gentle 8.5 mile circular, which took in the ruins of Jerveaux Abbey, and for the rest of the group Brymor Ice-cream parlour. 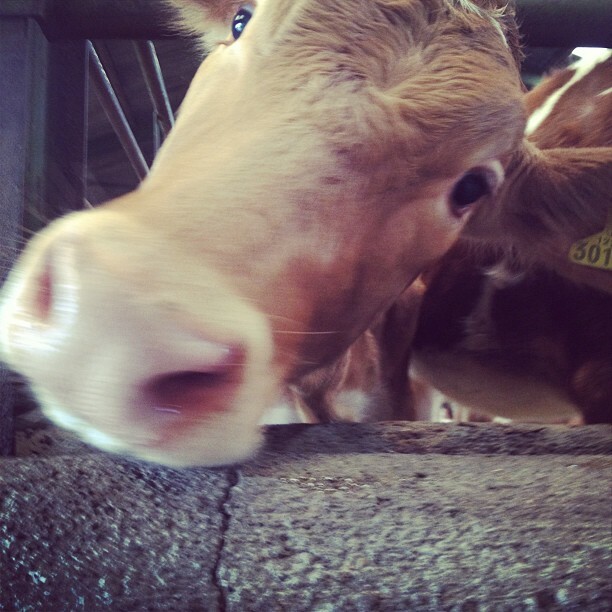 I just talked to the gorgeous cows instead. Considering the amount of ice-cream they were dishing out, there weren’t many cows in the fields surrounding the farm. I hope they weren’t all locked in a barn somewhere! The day before our hike in North Yorkshire I had a very enjoyable Saturday. I had a great long run on the treadmill (8 miles), and then went through to the Tyneside Cinema in Newcastle to attend the UK Green Film Festival showing of Vegucated, which I really enjoyed. If you get a chance to see it, I highly recommend it. 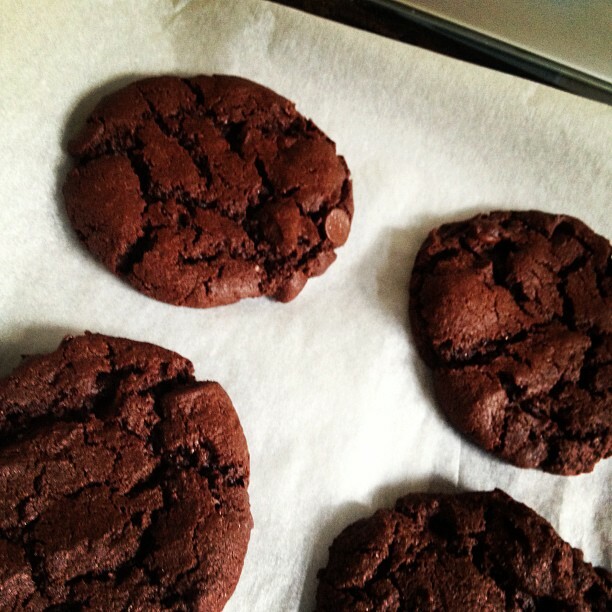 Tomorrow (Wednesday 30th) is my workmate L’s birthday so I have been spending the evening cooking up a storm (vanilla cake and choc-choc chip cookies in a glass jar with chocolate ganache), seriously naughty! 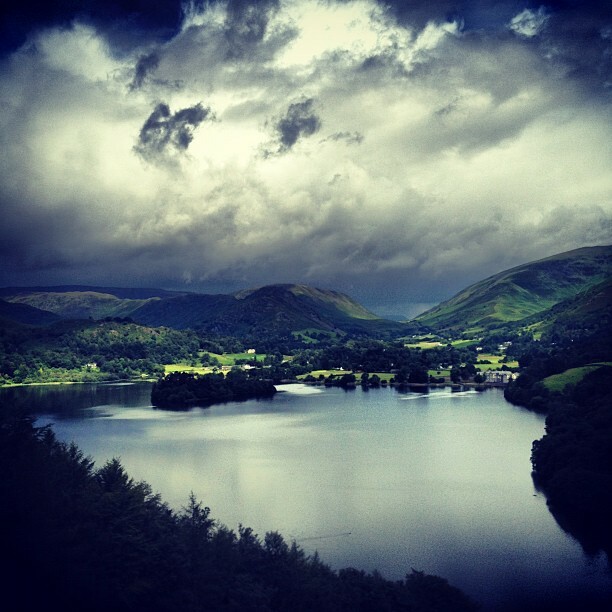 Fantastic day’s walking in the Lake District. 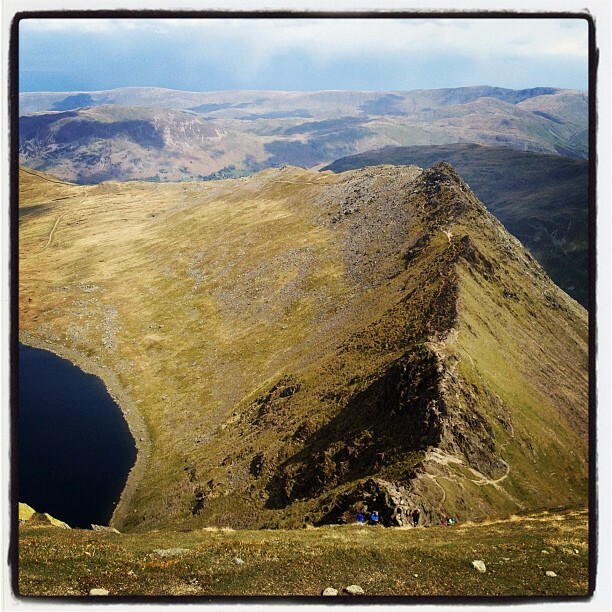 A last minute whim lead us to Glenridding to walk up Helvellyn via Striding Edge, and back again down Swirral Edge. The weather was good for walking: still, clear, and for the most part sunny and cool (although we did have about 40 minutes of snow!) We think the walk was about 8.5 miles, and fairly easy going, apart from the scramble along Sharp Edge and up onto Helvellyn. Most of DD&H were in Skipton for a weekend of walking, but a select group of us that hadn’t been able to head off to Skipton enjoyed today’s walk. Definitely a fantastic day!